Beginning in 2009, Plains Art Museum launched a new initiative to engage artists with communities in public spaces to create “defiant gardens,” borrowing the term from Kenneth Helphand’s study of gardens in wartime. The term poetically captures a sense of affirmation for something that is necessary but missing from our places. Rob Fischer is a sculptor, living in Brooklyn, New York, and Park Rapids, Minnesota, whose work has been featured at the Whitney Museum of American Art, the Hammer Museum in Los Angeles, the Corcoran Gallery in Washington, D.C., and many other galleries and museums. Based in Brooklyn and originally from Minneapolis, Kevin Johnson is a sculptor and public artist who has designed numerous public art projects, gardens, and rain gardens nationally. A resident of Moorhead, Su Legatt works in socially engaged art as well as studio practices and has led numerous projects in our region. An environmental artist based in the Twin Cities, Christine Baeumler has created downtown Fargo’s only pollinator garden that will help to sustain populations of species of bees, butterflies, and hummingbirds. Developed by working with Museum staff, other artists like MeLissa Kossick, local businesspeople, a horticulturist-ecologist-landscape architect, and teens, Baeumler’s Pollinator Garden includes gardens, a cistern to capture rainwater, and areas that attract pollinators and humans alike, defying the dwindling numbers of pollinators that are critical to our food supplies. The Pollinator Garden at Plains Art Museum has inspired the Museum’s Buzz Lab program. This is an exemplary annual paid internship program for teens that engages them in learning, teaching, creating, sustaining and advocating for the livelihood of pollinators in a healthy ecosystem. It is cross-disciplinary, competitive, and a reflection of the diverse backgrounds and perspectives that encompass the Fargo-Moorhead community. Defiant Gardens in Fargo-Moorhead have developed thanks to the work of many. Some of the many sponsors & partners include: Artplace America, The National Endowment for the Arts, the Bush Foundation, Moorhead Public Service, the City of Moorhead, Moorhead Parks and Recreation, Concordia College, The Moorhead Power Plant Study Group, FM Area Foundation, and Lake Region Arts Council. The Museum also thanks our lead artists, volunteers, laborers, neighborhood residents, Buzz Lab participants, Juliet Patterson, Jay Alsop, Jesse Riley, Joe Rinehart, Abby Gold, Monique Stelzer, and Baker Garden and Gift. Sodbuster is arguably the most well-known sculpture in the Fargo/Moorhead area, paying homage to our region’s history and the farmers and prairie workers of the Great Plains. 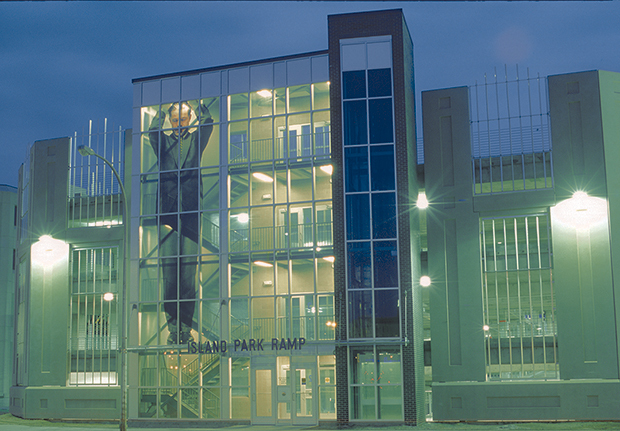 In 1978 the Fargo Parking Authority applied for and received a National Endowment for the Arts matching grant of $20,000 to help finance a major sculptural piece to be located in downtown Fargo. Luis A. Jimenez, Jr. was the artist chosen by a joint committee of NEA representatives and the Fargo Parking Authority. After extensive research of the region and several preliminary proposals, the now infamous Jimenez produced Sodbuster. For over 20 years it was located outside on Main Avenue and Broadway. 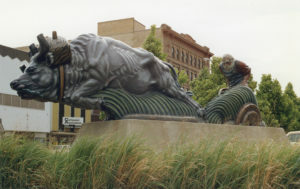 In 1991 the City of Fargo donated the sculpture to Plains Art Museum to oversee the ongoing care of the sculpture. Currently, Sodbuster is being restored thanks from the support from the Institute of Museum and Library Service (IMLS), and once complete, it will find a new home at Fargo’s soon-to-be-completed City Hall. Swedish artist Maria Friberg’s work was exhibited in Fargo in a solo exhibition during the Museum’s Verge series in 2001, which was dedicated to the work of emerging artists. Now well established and exhibiting internationally, Friberg’s work allegorizes the conventions and conditions surrounding masculinity and its multiple relationships to the myth of power. Her art uses video and photography to capture the nuances of masculinity manifest in subtle and poetic imagery. Atlanter was created in collaboration with Plains Art Museum and is titled after the Greek God Altas, who carried the world on his shoulders. Historically, human figures have adorned buildings since the first ones were built. The columns, or pillars, supported the building and were sometimes sculpted in the shape of men or women. Male columns are called atlantes, female columns are caryatids. The most famous are found on the Erechtheion in Athens built in 421-409 BC. Friberg has updated this ancient idea, integrating it into her work on masculine identity.